It is impossible to do OLD CITY HALL justice in a review. It is unusual in every way. Each morning, Gurdial Singh, formerly the chief engineer for Indian Railways and approaching his 74th birthday, delivers newspapers to the condominiums at the luxury Market Place Towers in Toronto. He begins at exactly 5:05 am and exactly 25 minutes later, Mr Singh reaches the 12th floor apartment of Kevin Brace, the most famous radio host in Canada. Mr. Kevin would be waiting at the half-opened door with a cigarette in one hand and a mug of tea in the other. Their ritual conversation never varied. Mr. Kevin would say, “Good morning, Mr. Singh” and Mr. Singh would reply, “Good morning, Mr. Kevin. And how is your beautiful wife?” Then Mr. Kevin would say, “More beautiful than ever, Mr. Singh.” Their routine never changed and each looked forward to their few minutes of conversation about gardening or other mundane matters until the morning in December when Mr. Singh arrived at the apartment and Mr. Kevin was not at the door. It was half way open but there was no sign of anyone until Mr. Kevin appeared, without cigarette and tea. Mr. Kevin said nothing until he whispered, “Mr. 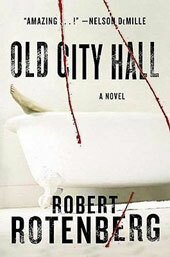 Singh, I killed her.” Thus begins OLD CITY HALL, the first of what I hope will be a series by Robert Rotenberg. Kevin Brace has the most recognized voice in Canada but after the whispered confession to Mr. Singh, he refuses to speak another word, not even to his attorney. There are great characters in this story. The first officer to arrive at the scene, Daniel Kennicot, joined the police after the unsolved murder of his brother. Kennicot had been a member of a prestigious law firm but felt compelled to try to find the killer by working in the police department. Detective Ari Greene, the chief investigator, realizes that Kennicot will be invaluable to the investigation of what will be a very high profile case. Albert Fernandez, a young prosecutor, is next in line for a homicide case, his first, and he has no idea who Kevin Brace is. Nancy Parrish is a solo practioner, trying to get her law practice off the ground. When she receives a call from Detective Greene telling her that Kevin Brace has indicated that she is his attorney, she is definitely puzzled. She had met Brace at a Christmas party and had done a short interview on his show, but she knew she was not in that class of attorneys who would eagerly jump in to defend a man like Kevin Brace. Her puzzlement deepens when her client tells her that he will not speak to her or to anyone else, that he will only communicate with her in writing, and that she must never mention to anyone that he is silent. OLD CITY HALL is a love story wrapped in an absorbing mystery. It is written beautifully, not poetic, but with every word crafted to move the story along and to move the reader. Kevin Brace is an intriguing character. This entry was posted in Uncategorized and tagged reviews, rotenberg, toronto. Bookmark the permalink. Beth, thanks for this review. You had talked about it before on Amazon and I was intrigued but forgot to write it down. It’s apparently available at my library and I’m going to jump in the car to pick it up. Maine, I know you are going to enjoy it. It will capture you from the first sentence.